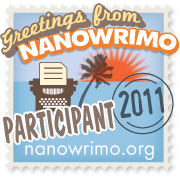 NaNoWriMo 2011 begins in 11 days, and I’ve just set myself up on the website. Set up with some trepidation I must say, because this time, I know what to expect and I’m nervous as hell. This entry was posted in Writing by bryanknower. Bookmark the permalink. Are you up for this – again????? Shite, how I admire your discipline, I wish I could do it!!! !